You may recall my previous post last month about this upcoming DVD release. As soon as I told my girls about it, they couldn't wait for our review copy to arrive at the door...especially my youngest, Bella, who is a huge Cookie Monster fan. And, just the other day while the girls were laid up yet again on the couch with a head cold, this DVD arrived at our doorstep. It couldn't have come at a better time, as I was looking for something fun to watch with the girls that they hadn't already watched over the course of the previous week from the DVR. Bella's eyes lit up when she saw the Sesame Street: The Cookie Monster DVD. Prior to getting ill, the girls had enjoyed a week at school learning about famous artists, art medium and overall art appreciation. Bella was quick to point out the front DVD cover art looked like Starry Night from Van Gogh. She couldn't help but giggle when she saw the famous painting was redone to include chocolate chip cookies. "Oh, Cookie Monster" she said with a grin. Bella's smile didn't leave her face for the duration of this new DVD viewing. She was glued to the screen, as was Savannah, as they learned about art appreciation, critical thinking and self control skills, through over 2 hours of fun. "There’s an all-new cookie museum in town and your favorite furry friends are excited to start exploring! Cookie Monster leads the pack in this nail-biting, cookie-munching thriller that guest stars Rachel Dratch of Saturday Night Live fame and celebrates the arts. Sesame Street: The Cookie Thief is a fun, action-packed special in which Cookie Monster explores self-regulation concepts – such as impulse control, following directions, and managing emotions. 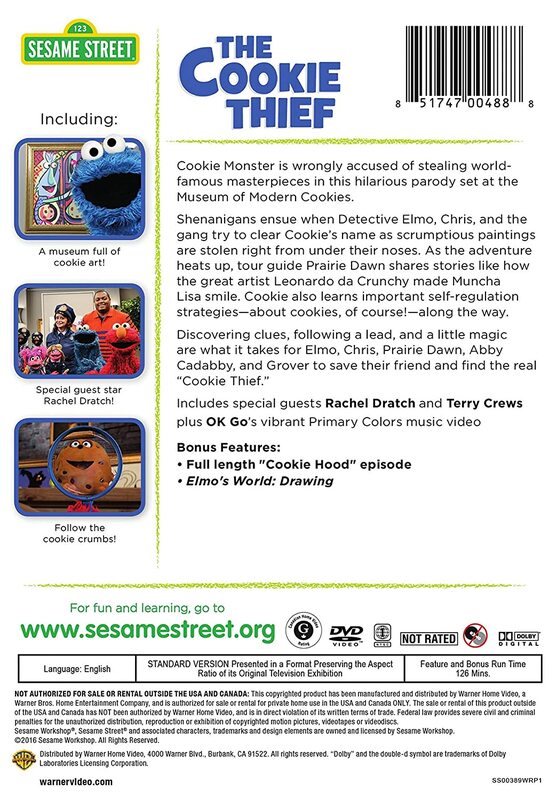 Warner Bros. Home Entertainment and Sesame Workshop, the non-profit, educational organization whose mission is to help kids grow smarter, stronger and kinder, will release Sesame Street: The Cookie Thief on DVD March 1, 2016 for $14.98 SRP. 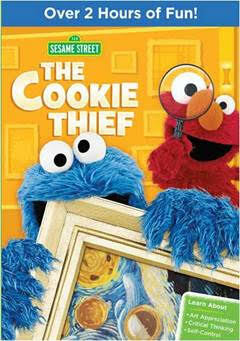 The kids would love to watch this one and I would also love to see it I always loved the cookie monster. Looks like a cute DVD! My grandsons would enjoy it!